MORÓN AIR BASE, Spain — Two Airmen from the 496th Air Base Squadron received the honor of being Airlifters of the Week, Jan. 31 on Morón AB, Spain. Additionally, Roll is an outstanding supporter of the local community as he reinvigorated the Airman and Family Ministry Center. 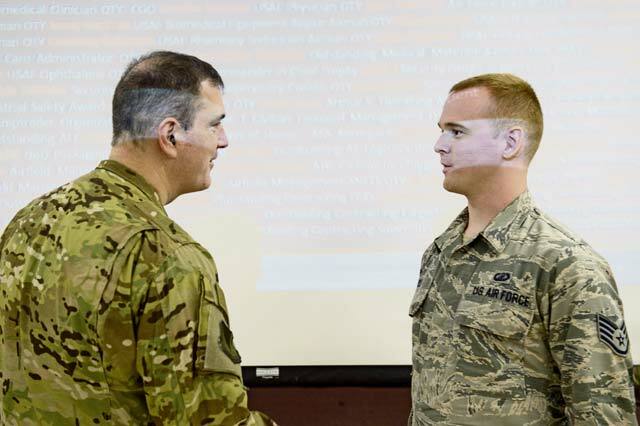 His efforts with the A&FMC boosted morale and espirit-de-corps among deployed U.S. Airmen and U.S. Marines by providing a venue for them to complete their education. His hard work and dedication goes beyond his scope of responsibilities and pay grade. Roll’s commitment, dependability, mission accomplishment, focus, and service before self underscores his nomination as an 86th AW Airlifter of the Week. 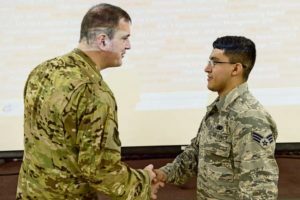 Senior Airman Ramiro Rios, 496th ABS Fuels Controller, is the second Airman from Morón to receive Airlifter of the Week. Despite arriving mid-December, 2018, Rios took the lead on coordinating recertification of fuel trucks for off-base transport of dangerous goods. Additionally, the certifications have saved the U.S. Air Force over 100,000 dollars in shipment costs to transport the trucks to Germany for recertification. Additionally, Rios coordinated, dispatched, and controlled the delivery of 92,000 gallons of fuel within one week. He processed fuel transactions worth 273,000 dollars and he accounts for bulk fuel inventories of 2.7 million gallons every day. These accomplishments have made Rios a very obvious and deserving candidate as Airlifter of the Week.